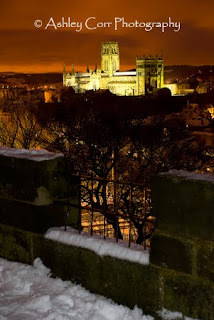 A couple of weeks ago, the 27th December to be exact, I headed through to Durham City Centre to have a crack at more low-light photography. There had been more overnight snow and the roads were a bit ropey, but it didn't deter me as I went on the wander once again. On reaching the highest point in the park I noticed a set of steps that lead to an even higher viewpoint. Well, no time to hesitate - let's see what's up top! It turned out that the steps lead me up a mock castle tower and on reaching the summit I was greeted by an excellent sight. 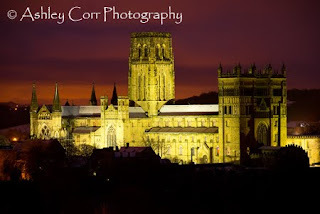 It was a stunning panoramic view of Durham City Centre and it's dominating Cathedral, illuminated, and making a great focal point for any photograph. Well I quickly set up shop and got on with the job, firing off more frames than I can remember as the available light diminshed. Well, I found myself a great viewpoint and definately one for the memory bank. Imagine the views up here on a nice Summer's day, and in the Autumn when the colours are out. Be sure to see the results here - stay tuned! The snow keeps on falling and I can't remember a time when it fell for as long as it has. It's been 3 whole weeks and there's still more on the way, but there's always scope for more photography so strike while the iron is hot - or cold as in this case! Yes, the sun is shining and there's a clear blue sky up above. Down below is a thick carpet of 'Snar', as we say in Sunderland. That seems like a nice combination for more snow scene photography so after a nice hearty Sunday roast I was lacing up my hiking boots before heading out to do the necessary. The customary two pairs of socks ruled the day once again - gorra keep them toes warm ya knar! Once again I jumped into the car and headed aimlessly in my search for good photo's. I was driving here and there, trying to get that brain spark that would take me to the ideal location. The cogs were turning swiftly in my head, but as I continued driving around Sunderland the sun had dropped behind the thick cloud cover and the place suddenly looked rather flat. Never mind, it only takes a fraction of a second to capture a good photograph, and the sun might briefly show up, so it was time to find a nice spot where I could set my gear up. 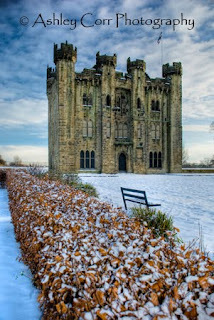 I found myself in the grounds of Hylton Castle, Sunderland. This is a place that I've frequented quite often during 2009, especially in Summer when the colours are out. Today was a very different ball game though. Not a great deal of colour, although the sky offered more blue than it did half an hour ago. The sun was round the back of the castle but I managed to preserve the detail in the sky with an ND filter, whilst retaining the fine detail in the castle's stone work. It worked quite well and the subtle colours in the scene made it a nice shot all round. Mind you, with a slight breeze it was a case of waiting a couple of minutes for a quick burst that would lift the flag, as it looked better against a gust of wind rather than being draped 'Dead Style' against its pole. The sun continued to shine and I made the most of it before it was off behind the clouds once again. I managed to grab a couple of three-stitch panorama's of Hylton Castle and its grounds before heading back to the adjoining car park. Once I was back in the car I had to negotiate the thick snow to get out of there, and after a few wheel spins I was off. Phew! 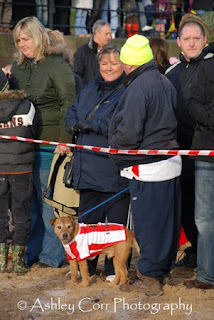 Our 2009/10 new year celebrations took place in York and we had a great time. My wife and I arrived at our hotel mid-afternoon and after dropping off the handbags and gladrags we made our way into York city centre for a drink and a bite to eat. We checked out a few pubs in preparation for a busy night on the town before my other half suggested a bit of retail therapy. Well, not being a one for the shops I suggested that we went our separate ways for an hour. 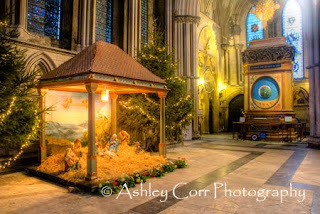 This gave me a chance to spend some time photographing York Minster, while she spent lotsa money in the shops! 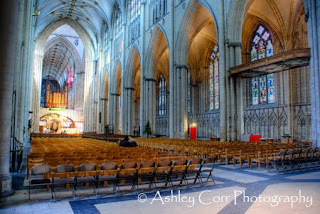 I remember visiting the Minster two years ago and it was free entry. Times have changed -there was now an admission charge of £6. Although I was a bit surprised I was more than happy to pay, especially as the annual upkeep of the place runs into hundreds of thousands of pounds, plus the fee guaranteed me unlimited visits to the Minster for twelve months. 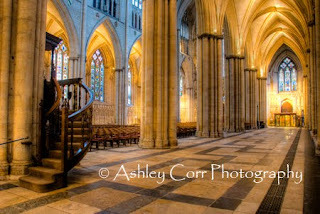 Another advantage, unlike Durham Cathedral, York Minster has a very relaxed policy regarding photography providing it is for personal use only. Great - a free run of the place - time to get cracking! The admission charge must have sent a few people packing after entering the Minster as the floor was almost bare, apart for a small group who were on a guided tour. I set my gear up near the Central Tower, looking across towards the Rose Window. I was using a slow shutter, around 1 second, with an aperture of f13. From there I headed towards the Great West Window, shooting from centre-aisle near The Nave. My one hour escape from shopping hell was over like a flash. I'd manged a dozen or so shots and it was now time to reconvene with my wife. I only photographed a fraction of what was on offer, but never mind, I'll save the rest until my next visit. Thanks for reading. Until the next time...See ya! 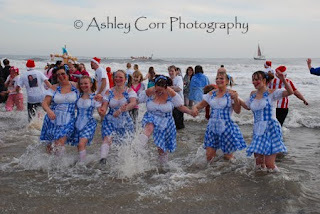 Sunderland's annual Boxing Day Charity Dip takes place at Seaburn, which is situated a couple of miles outside the City Centre. As expected, there were hundreds of participants - rather them than me! I mean, I don't mind contributing to good causes but the idea of running into a freezing cold North Sea isn't one that appeals to soft buggers like me. With the event kicking off at 11.00am prompt, I was cutting it fine when I got caught in Seaburn-bound traffic on Thompson Park Road at 10.40am. 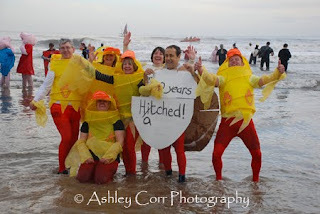 I got through it eventually and managed to park my car behind the Seaburn Centre before making my way onto Seaburn beach with just a couple of minutes to go before the stampede. I had me rather naff green wellies on so that I could wade in and grab some decent shots, which is what I did. A couple of rather brave lads wearing Newcastle United dressing gowns ran past me and I nearly got knocked to the groond when I tried to trip the 'Black n' whites' up. Me camera almost bit the dust too, but the neck strap saved me bacon as I had it wrapped round me wrist - phew! Anyway, by the time the dippers had left the sea behind and retreated to the warm Seaburn Centre, I was quite soaked and quite cold - very cold infact. Me feet felt like two blocks 'o ice. That was me whack. Back to the car and a belated appointment with the heaters! Ash (still trying to get warmed up - 7 days later) he he.